One beauty expert is making it a million times harder for us to stop biting our nails. The newest nail fad is something very odd in theory, but it has quite a following already. Chocolate nails (yes...) is the latest talon trend. 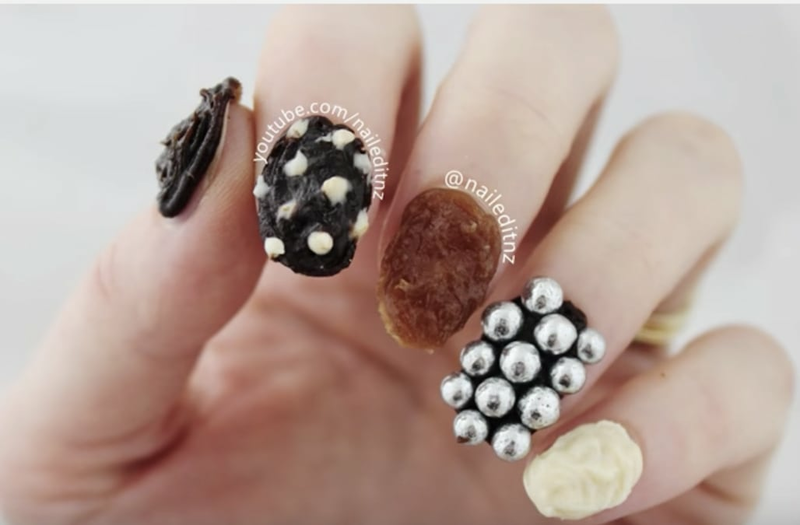 A nail artist and vlogger from New Zealand came up with the sweet trend and posted it to her Youtube channel. After drizzling and swirling chocolate icing on her nails, Jessie embellishes them with edible rubies and pearls. She even alternates between dark, milk and white chocolate! And after the nails have dried, they're perfectly edible. Even though Jessie says they're not particularly beautiful looking, some followers are loving this nail art and chocolate combination! Here's another shot of my New Years nails from last year 🥂. Off to move house now - I'm about to get a nail room again!! I'm probably going to cry, it's quite uninspiring running a YouTube channel and business from your kitchen! I'll try update Snapchat throughout the day (naileditnz). One more shot of my latest five-in-five nails... blue themed! Purple will be next, and I'm also really keen on a rainbow theme. Also, my phone died so I got a cheapie and I can't use emojis anymore :'( how do Android users cope?? Gorgeous design, @linda165_yt - check out her original version on her IG! I've got a new video going up in 45 minutes, but in the meantime here's another shot of my last one 💅🏻. Hope you're having a good weekend! You can follow more of her awesome tutorials on her Youtube feed or Instagram.